You are here: Home / FAQ’s / Pulse induction vs beat frequency technology? Pulse induction compared to Beat Frequency metal detectors. Now we are getting technical and this all sounds like a ton of jargon. So lets get stuck in and simplify it so that you are no longer in the dark with these 2 key metal detector technologies. Beat Frequency Oscillator Technology (BFO). This is the simplest for of metal detector technology and is used most often in entry level machines. This metal detector has 2 coils placed close together. The first coil sends an alternating low frequency current produced by an oscillator into the ground. If a metal object is present in the ground beneath the coil magic happens. The alternating current passes through and around the metal item and causes “eddy currents” around the metal which causes another magnetic field. This magnetic field is then picked up by the second coil and an alert is sent to the control box. 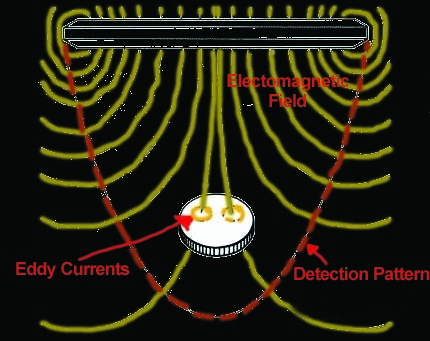 This type of detector requires movement to work. The swinging action over the metal target allows this field to be picked up. If you hold the coil still over a target you will not get a response. This is a lower cost fairly accurate technology which is why it is used in entry level machines. Unfortunately when encountering ground mineralisation (wet sea sand or harsh old red soil) this technology is more susceptible to producing false signals. This is a more complex form of metal detector technology and works as follows. A high voltage pulse is sent into the ground, if no metal is beneath the coil the spike in voltage is measured and decrease at a uniform rate (which the detector has in memory). However if metal is present that object will conduct some of that voltage within itself. This interferes with the time taken for the voltage to return to zero (causes the time taken to return to zero to increase and is picked up by the detector and indicated to the user. Different metals conduct electricity to a greater or lesser degree allowing the detector to guess what type of metal is beneath the coil. This technology does not require movement to work and keeping the still or slight movements will still produce a response. This technology is not affected by ground minerals and is thus preferred for gold prospecting in harsh soil conditions and also for dive detecting or hunting in wet black beach sand. This is more often found on higher end professional detectors. Some detectors try and combine both technologies with varying degrees of success. This article is best read along with the page on Frequency. Both together will help your understanding of the metal detector greatly. Hope u found this handy. Click the g+ button below if you did. Thanks!